Rain has a way of complicating things, especially when working outside. Today, the rain came down in frog-strangling proportions, making our work site a soggy and muddy mess. Even Gene Kelly might have thought twice before singing and dancing in this downpour. Fortunately, we moved the drilling rig to a new location before it started to rain and we were able to prepare the site for the concrete pad that will hold the pump apparatus. 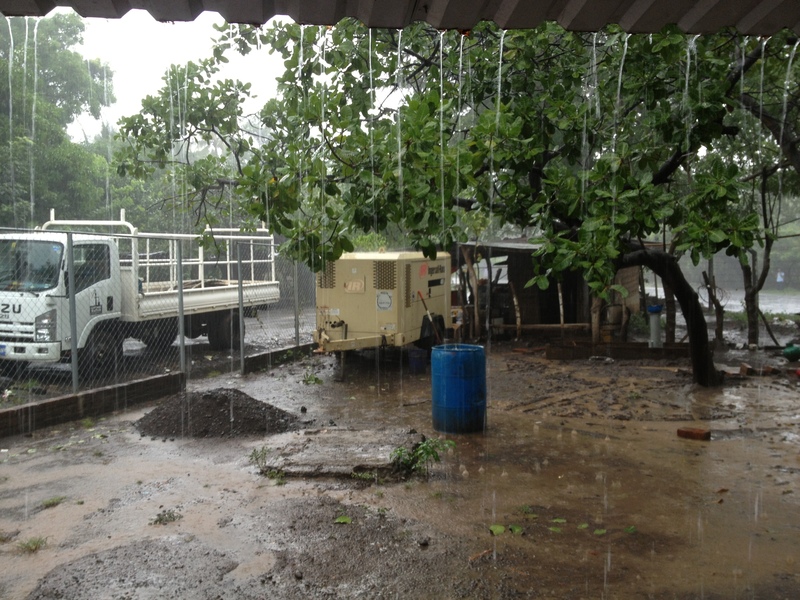 When the rain started, the Agua Viva El Salvador staff and our team elected to keep working in spite of the rain. That’s when things got really exciting. These are a few of the best things that happened as we worked in the rain. 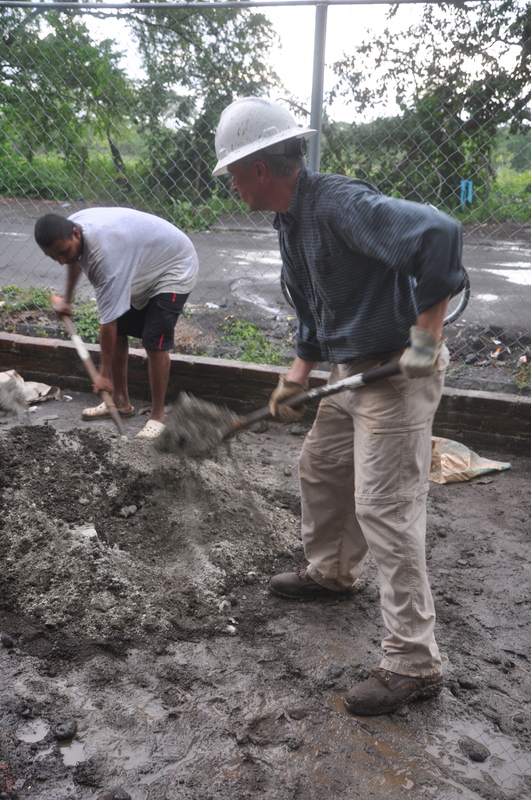 Resourcefulness | Our team had to think creatively in order to mix and pour concrete in the rain. Because we mixed the concrete and sand on the ground, we had factor in exactly how much water to add to what the rain was contributing. And then we had to find plastic to cover the area where we needed to pour the mix. It all worked out! Neighborliness | When the men in the village saw us working in the rain, they stepped up to help. One man contributed the plastic we needed, another provided the twine to make our makeshift tent, others helped shovel and move the sand to where we needed it and then helped us to move the concrete to the pad site. Joyfulness | The rain did not dampen our spirits. Instead, there was lots of laughter and good humor as we worked cooperatively to get the job done. 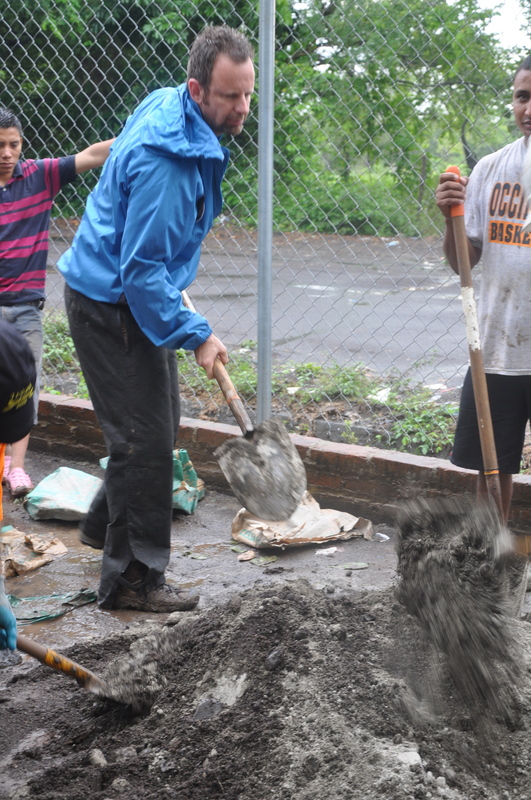 Many willing hands helped us to finish the task faster in the rain than if we had done the same task in the sunshine. 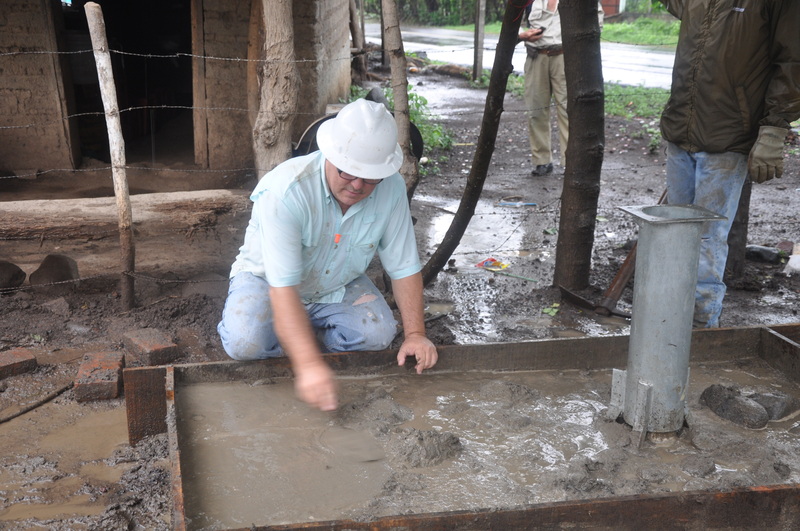 Because we continued to work in the rain, we are still on track to complete the water well by tomorrow and to present it to the people of Tonalá. We can already feel the excitement in the air. 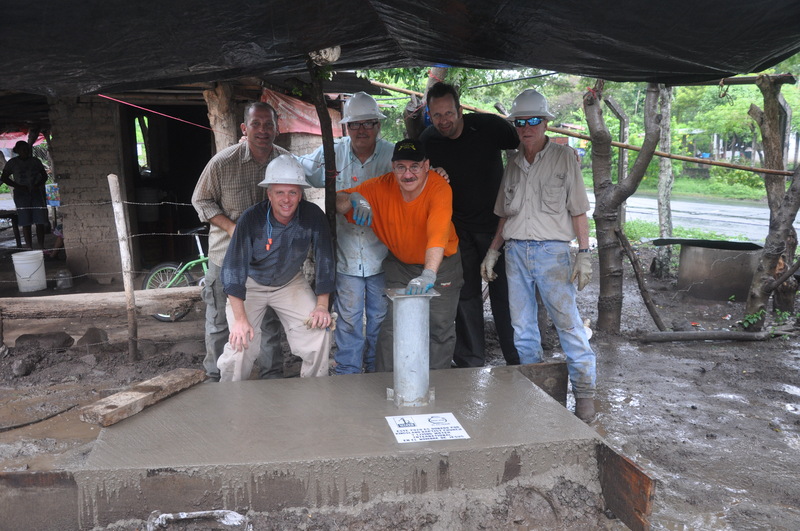 The location of this well will make it accessible to all of the people of the village. 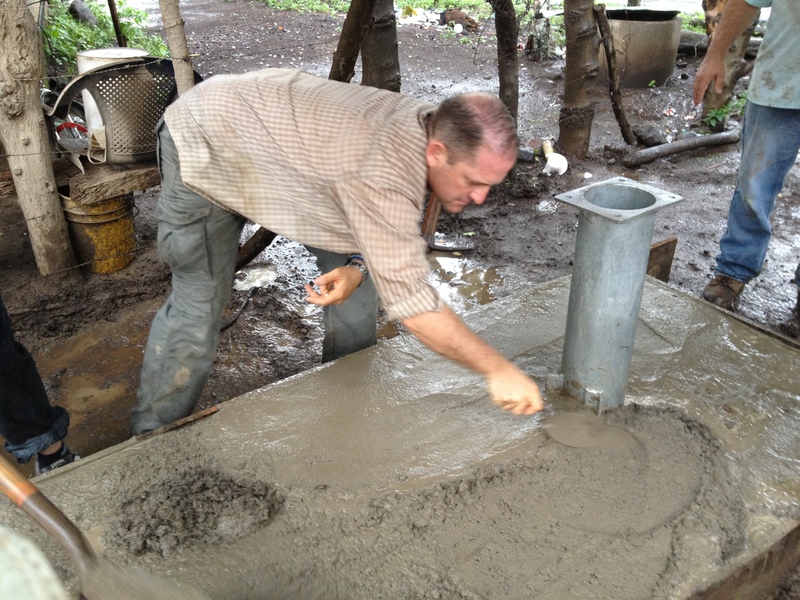 The well will also save lots of folks lots of time because they will not have to walk as far to fetch water. It’s possible that it may rain again tomorrow but it really doesn’t matter. Come rain or shine, we are determined to get the job done for the people of Tonalá and to present them with their new well in the name of Jesus, the One who quenches deeper thirsts. And the rain came down, making our work site a muddy mess. David Hopkins working on the pump pad. Jim Dry putting finishing touch on the pump pad. 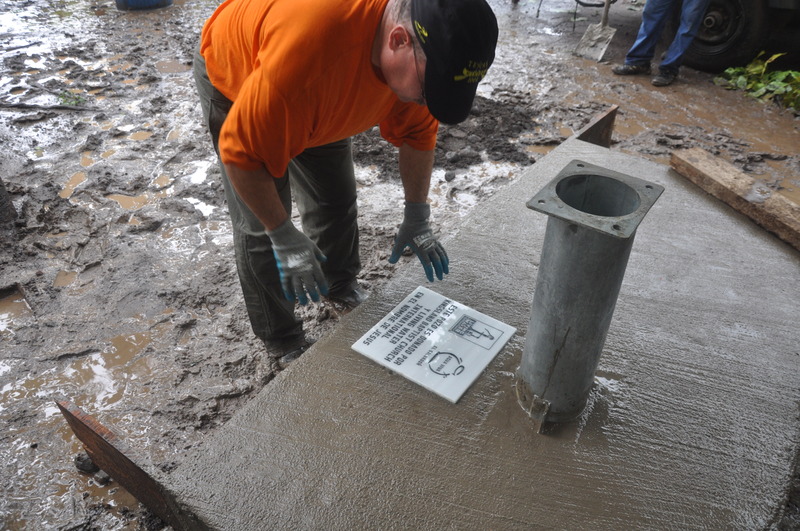 Setting the water well dedication plaque in place. Our team of guys after a hard day of work. Well done, good and faithful servants. May there be a joyful noise at the dedication tomorrow! Thanks, Jill. Looking forward to dedicating and presenting the water well to the community. Always a joyful time.